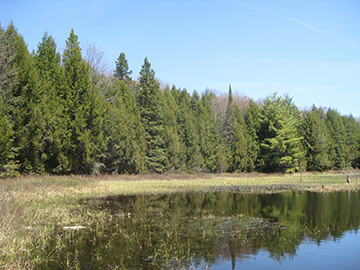 The Mississippi Madawaska Land Trust is planning a nature walk at Rose Hill Nature Reserve on July 28th. This summer’s event will feature a hike along the Pumpkin Trail to Charlie’s Pond. 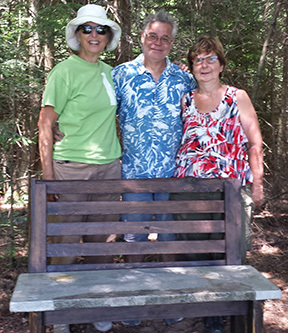 The family of Charlie and Vera Armstrong, who were the original owners of this property, acquired in the WWII period, have installed a memorial bench at the picnic spot at Charlie’s Pond. We’ll be holding a brief ceremony to honour Charlie and Vera and the beautiful legacy they have left us. Hikers can gather at 10:30 a.m. near the entrance to the Pumpkin Trail, just before you reach the parking area beside Rose Lake. Pumpkin Trail was the original Road that settlers used to get from Rose Hill to Denbigh. The Pumpkin Trail has been rutted by ATVs, so sturdy footwear is recommended. Bring along a lunch to enjoy at the picnic spot. After lunch, there will be an opportunity to hike the Hemlock Trail loop which adjoins Pumpkin Trail near the picnic spot. The Memorial Bench is the first installed under the provisions of the MMLT Commemorative Bench Program. It features a lovely cedar bench with decorated “Lone Pine” concrete seating. It is the work of Tuscany Concrete artists Ted and Sherry Oosterlaken of Tuscany Concrete, Fernleigh, Ontario a winner of our artists’ competition for bench design.